Last edited by chaosrocks; January 29th, 2008 at 11:01 PM. Interesting.. So the inside of an slaughterhouse is an environment too? Or do we have to show how it's positioned in it's surroundings? Congratz on the new format! 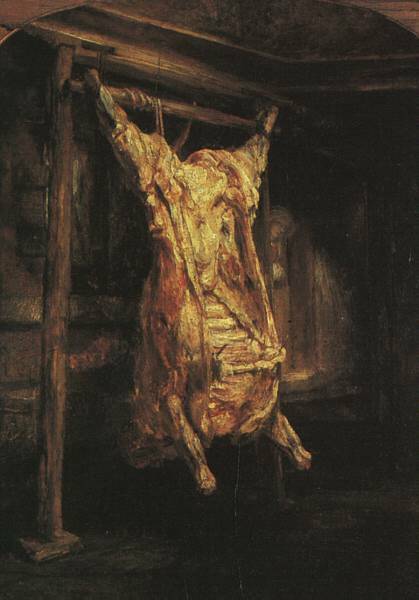 in olded days tha abbatoirs in the south were openair sheds.....they butchered in the wintertime. I think this topic is rather strange, it's a challenge for me (I'm not good at interior) and that's good. Water, air, and land, and the interrelationship that exists among and between water, air and land and all living things. Almost all the definitions refer to an organism that relates to the environment. I guess that organism could be an action or an activity too. So this made me look in a different way to these topics. First I was just trying to make a nice picture that agreed with the topic, but now I understand that without the actual creature, action, activity or organism being displayed you should be able to see that it could live there. I don't know why I'm typing all this 'cuz it'll probably look like a load of crap to you but well, I changed the way I think about "EoW" and I've got some nice ideas now for the Abattoir. Hoping to make some time for this soon! edit: The idea that I have now is soooo awesome! Damn perspective kills me everytime I try to put it on paper..
Last edited by Sjouke; January 30th, 2008 at 05:25 PM. 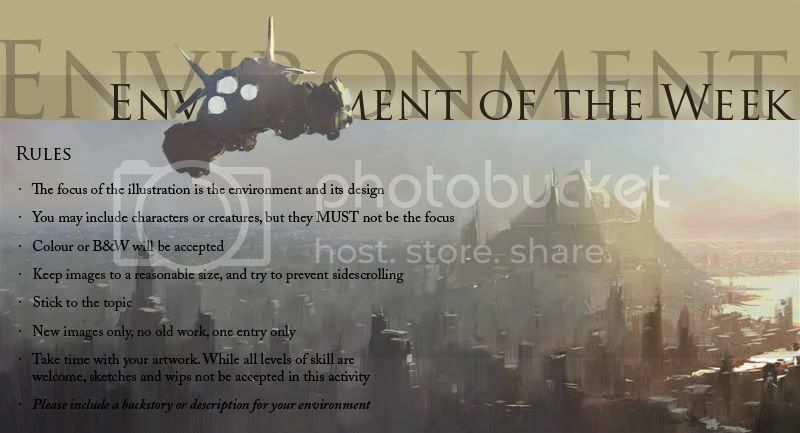 It's fairly standard terminology for concept art that "Environment" is the location/surroundings where the action (of the movie/game/story/whatever) takes place. That includes interiors and exteriors. Lots of classic games are interior only. It's an important skill to develop. Still debating this one, but maybe I'll come up with something and try to actually finish this time. Looking forward to seeing all the final entries nonetheless! Mickeymao, I salute you for summing up my own inevitably long-winded rant in response to the above. I usually don't get caught up in the semantic arguments that immediately follow a topic anouncement. This stuff usually works itself out. I think I'm more curious this time... it's just strange to me I guess that an Abattoir is being debated so thorougly as an exterior or interior. Read up on Temple Grandin. She supposedly leads the field in slaughterhouse design. An environment is simply the positioning of elements or situations concurrent to the viewer, or put even more simply, "the stuff around you". Inside, outside, it's still an environment. If you're not good at interiors, consider this practice. I'm gonna. Last edited by Corrick; January 30th, 2008 at 08:43 PM. I'm a new member and I'm eager to try my hand/wacom at this here slaughter-house environment. I'm still up in the air as to what genre my Abattoir will take; modern, futuristic, historic or fantasy. Great, but creep subject. I can't wait to start. I look forward to seeing what everyone creates. Here is my early conception of the enviro. Looks like I'm going futuristic so far... but no meat yet. Looks very good Lucky Munky. They throw the waste in the lake. I want to give it an 'older' look. Maybe some steampipes will do. Last edited by Sjouke; January 31st, 2008 at 03:20 PM. Yeah. Inside or outside, the environment is where your character finds him/herself. Abattoir gets used in a broader sense a lot, too. I have a WWII Time Life book that uses it like "(however many) thousands of marines would then be thrust into the abattoir of a tiny volcanic island known as Iwo Jima, or Sulfur Island." This is a relatively broad subject. Just out of curiosity, how do you guys get such straight lines in your sketches? are you using photoshop? I have a hard time with my Wacom and getting such straight lines for my perspective shots. any info will help out! using the brush tool, click on the point where you want the line to start, then, holding the shift key, click where you want it to go. works best with pen-pressure controls for brush opacity/size turned off. Lucky Mundi: That doesn't look like a hall where the 'animals' are being slaughtered but more like some sort of transport corridor. Maybe you could add a transport rail or something.. Just an idea that I have when I look at your sketch. Keep it up! Everyone else: Good luck drawing! Last edited by Sjouke; January 31st, 2008 at 07:07 PM. Last edited by britt; January 31st, 2008 at 11:16 PM. -Britt: I was so tempted to go 'dark fantasy' with this. I love your look. I am still toying with the idea of a human slaughter house for my pic. -jmorris: I'm a-o-k with you adjusting my pic. I really like your vision... however, I am going to hang meat along that side, in front of that wall, but I wanted to get the lines right first. -Hideyoshi: I am honoured to have my art anywhere near your work. 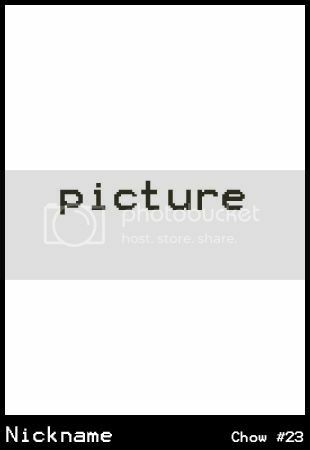 Your pic is sweet. I'm a huge fan. -Sjouke: I'm working entirely in PS. Hallo's got it right, point then shift-point will create a straight line, & holding shift will give you your vertical and horizontal lines. I'm excited to see where you take this. I am definitely in on this one, this will be my first attempt at doin this one..
titled "st George always wins: or why dragons are extinct"